Many of the early pioneers faced the hardships of this country where wars, famine and disease were the norm. Leaving everything behind, heroic souls came not only to save the souls of Indian nations, but also to minister to these frontier families. One such person was St. 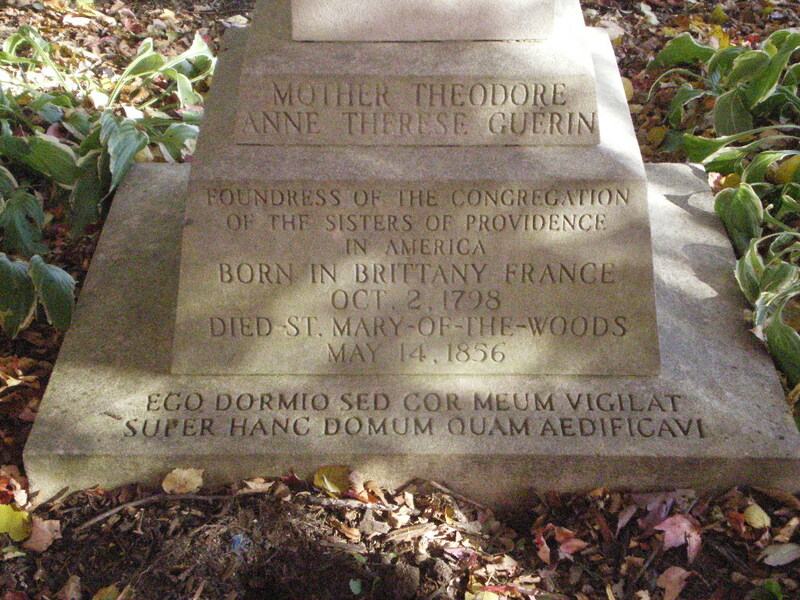 Mother Théodore Guérin, who became the eighth American Saint and the first Saint from the State of Indiana on October 15, 2006. View inside the Church of the Immaculate Conception where the relics of St. Théodore Guérin are located on the front left hand side of the Church. 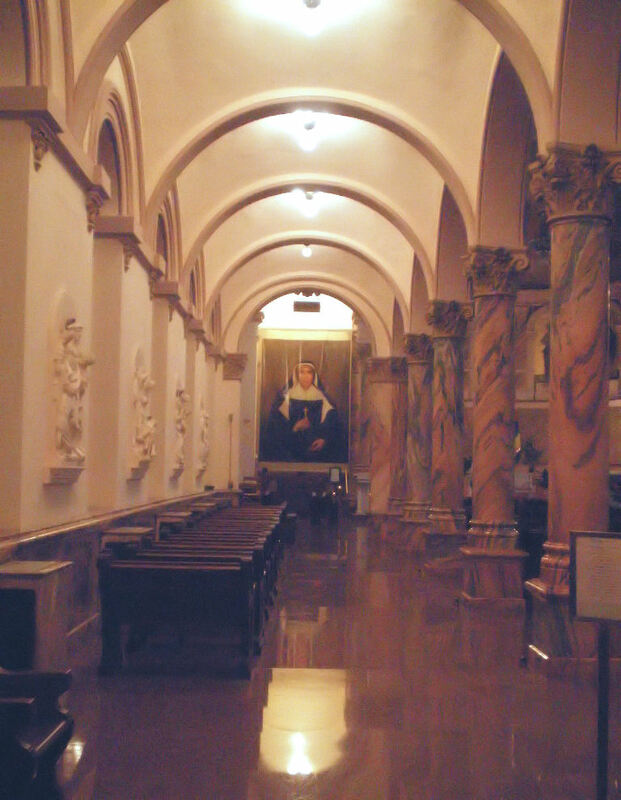 Also on the left side, located on the floor, is a plaque over the vault where the relics of other Saints remain. “What strength the soul draws from prayer! In the midst of a storm, how sweet is the calm it finds in the heart of Jesus.” St. Théodore Guérin. The sixth General Superior, Mother Mary Cleophas Foley, not only completed the building of the Church of the Immaculate Conception, but she also built the Blessed Sacrament Chapel of Perpetual Adoration in 1924. 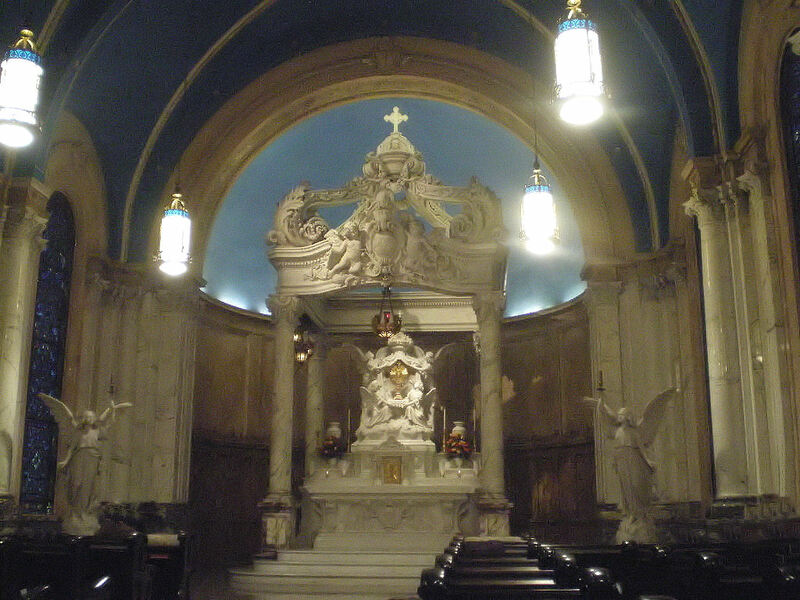 The baldachin altar was carved in Italy from a single block of white Carrara marble and weighs 8,000 pounds. It is located at the top of a flight of stairs on your right, coming from the Church and before reaching the museum. When Anne-Thérèse was almost 12, her father was granted leave to spend some weeks with the family before setting out for Russia with Napoleon’s army. Tragically, he was robbed and murdered by a group of brigands near Avignon. As a result of this news, Madame Guérin’s health was ruined, leaving her totally dependent on Anne-Thérèse’s care for the next five years. Never during this time did the desire to become a nun leave her and even when her Mother tried for four years to change her mind, Anne-Thérèse remained firm to her vocation. Finally when Anne-Thérèse was 24, her Mother suddenly changed her mind and on August 18, 1823, Anne-Thérèse entered the Sisters of Providence at Ruillé-sur-Loir, France being given the religious name Sister St. Théodore. 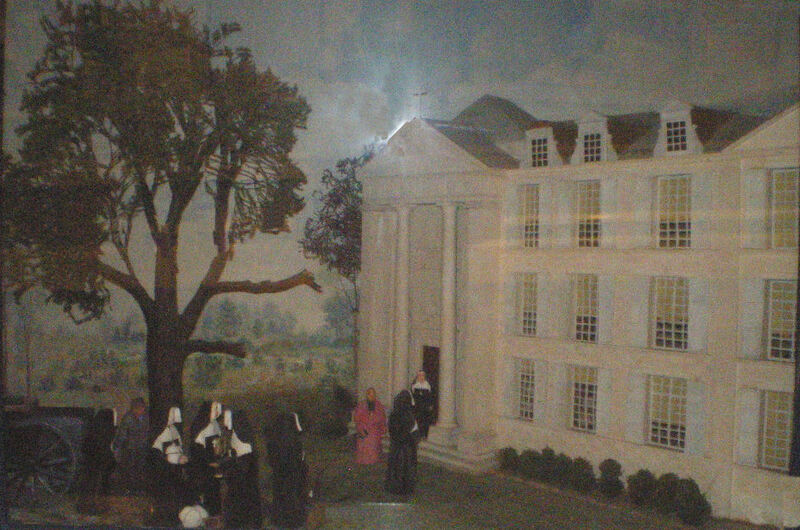 This is one of twelve dioramas showing the history of the foundation of the Sisters of Providence at Saint-Mary-of-the-Woods, Indiana. 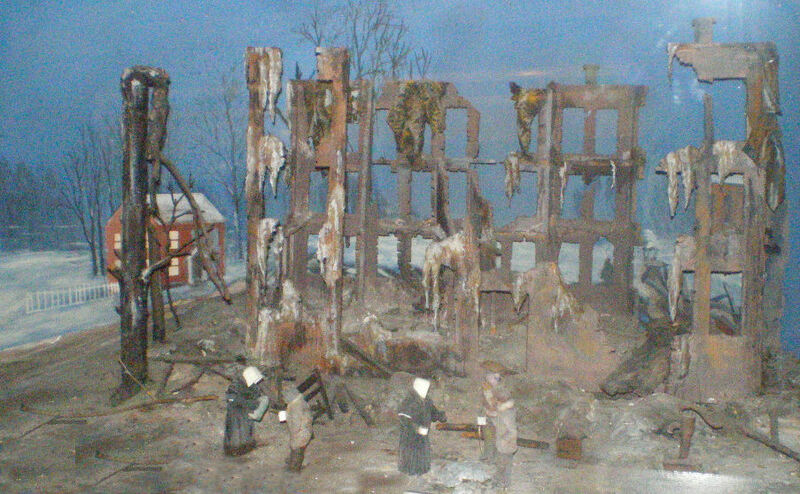 Completed in 1940, these dioramas are the work of Henri Marchand and Gregory Kamka. St. Théodore Guérin, four Sisters and two novices leave their Motherhouse in Ruillé-sur-Loir, France, headed to Terre Haute, Ind. 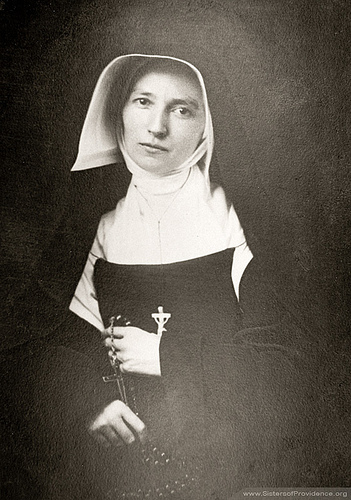 Sister St. Théodore was first sent to teach at Preuilly-sur-Claise in central France and served as superior of schools in Rennes and Soulaines, where she also ministered among the sick and poor. There, she became ill, most likely with smallpox, and nearly died. The illness damaged her digestive system and, for the rest of her life, she could only eat a simple, bland diet. In 1839, the Vicar general of the See of Vincennes (Indiana), Bishop Celestine de la Hailandière, came to the convent at Ruillé-sur-Loir, France petitioning the nuns to send him several Sisters to establish a Motherhouse and school in Vincennes, Ind. Mother Mary told Sister St. Théodore that she wished for her to go, but “if you feel you cannot go, we cannot open the mission.” Sister St. Théodore, who was 41 years old, not in good health, wrote to the Bishop of Le Mans for advice. “Let us then consider ourselves nothing, but let us be ready for anything. Since you have been chosen, think of nothing but preparing yourself in the best manner you are able; bring to it a good will and rely constantly on help from Above,” the Bishop wrote. So, resigning herself to God’s will, she prepared for her journey to Indiana. On July 27, 1840, Sister St. Théodore and four other Sisters, set sail for the United States on board the Cincinnati. Once on board the Sisters, who had carried with them several farewell gifts, opened the gift from their generous benefactor, Comtesse de Marescot. It was marked “confections” and they thought they should look inside before giving it away and found layers of orange leaves covering candies, and among the candies lay pieces of gold, three thousand francs in all. Once on board the Cincinnati, Sister St. Théodore kept a journal of their travel to the US, the hardships they encountered in their journey to Indiana, and more. 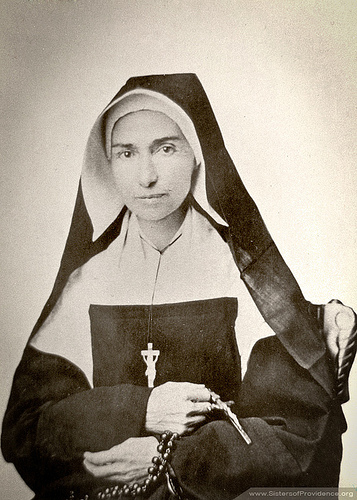 Titled Journals and letters of Mother Théodore Guèrin: foundress of the sisters of Providence of Saint Mary-of-the-Woods, Indiana, it is well worth reading. In 1904, Sister Mary Theodosia Mug compiled Mother Théodore’s journal. In 1908, suffering from damaged nerves in her arm and a stomach tumor that had developed during those four years, she prayed to Mother St. Théodore at her tomb and was cured. She became the first miracle that started the process of canonization for St. Théodore. Throughout Mother Théodore’s journal, she never wrote about her sufferings, not only with the journey and the academy, but also with the Bishop who refused for her money at times and the title of Superior. Interior of the Church of the Immaculate Conception, where St. Théodore Guérin is buried. After 46 days at sea, they entered the bay leading to New York City on September 5, and spent five days with the Parmentier family. André Parmentier, a noted horticulturist in France, was the founder of the New York City Botanical Gardens. He died in 1830, but his wife, Sylvie, devoted herself to welcoming Bishops, missionaries, priests and religious who would come from Europe, giving many a place to stay before heading on their journey. Then the Sisters made their way by train to Philadelphia, where they were met by Mr. Frenaye, who handled business matters for the Bishop of Vincennes. He informed the Sisters that he didn’t even know they were coming, but would advance the funds needed for their trip out West. Before heading West they spent some time in Emmitsburg with the Sisters of Charity. 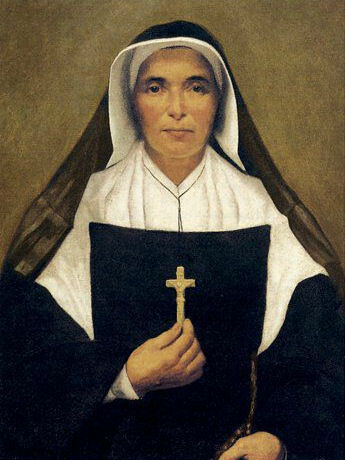 Mother Rose White, who was one of Mother Seton’s first companions, told Sister St. Théodore how much they had suffered when they first came to the US, which renewed Sister St. Théodore’s courage for the trials ahead. She also learned one vital piece of information – the key to a successful school was music, “no piano; no school.” One thing that Sister St. Théodore noticed was that the further West they went, the poorer people became, including the Bishops, priests and nuns. Money was lacking, but not spirituality, for the Faith was in great demand in the US. Many of the bishops and priests rarely spent time at home, but rather traveled throughout their diocese many times, sleeping anywhere – even under a tree. Gathering advice from the religious that she met along the way helped her prepare for the future mission. 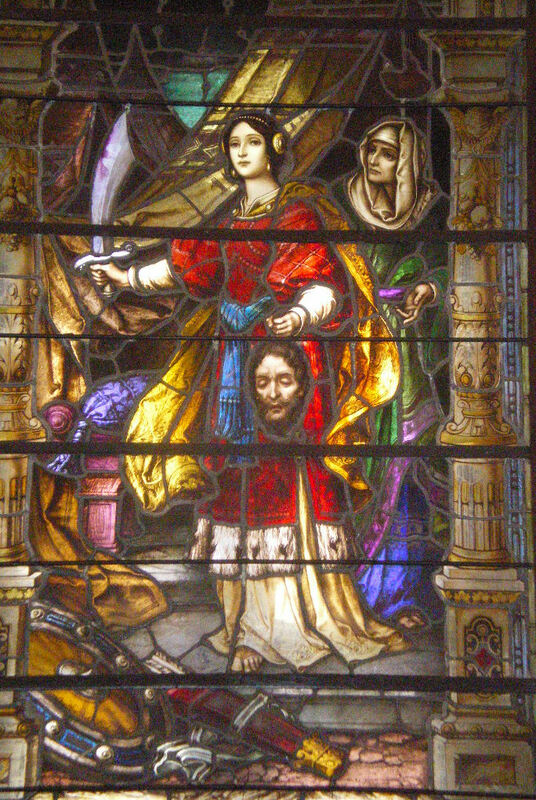 Judith with the head of Holofernes. One of the stained glass windows inside the Church. Finally on September 18, their journey to Indiana began, which would take them a month to reach. At the suggestion of the Bishop they wore secular clothing on their travel West, since it some parts of the US might be dangerous for the nuns to wear their habits. Most Americans at this time were very hostile to the Catholic Church and to the Religious, since many organizations were viciously slandering the Church. They traveled for two day & nights by stagecoach; then 150 miles on a river boat down the Ohio River to Cincinnati. Making a stop in Madison to meet the Bishop of Vincennes, who told them of the misunderstanding that resulted in no one being there to greet them in New York City and that the convent that they were going to was not ready for them until spring. He arranged for them to stay with the Thralls family once they arrived in Terre Haute. The Sisters continued their journey by boat to Evansville where they took the stagecoach to Terre Haute after crossing the Wabash River by ferry, since the river was swollen. With no building, house or even a village in sight, they alighted from the wagon and were led down through a deep ravine to the other side where a little single room log cabin was. Inside was a lighted altar with the Blessed Sacrament exposed and here the Sisters poured forth their gratitude to God for a safe voyage. Before arising, Sister St. Théodore kissed the ground, ready for the work ahead. Originally the Thralls house, which St. Théodore Guérin bought for the Sisters to live in until the convent was completed. Four postulants had been waiting for their arrival. 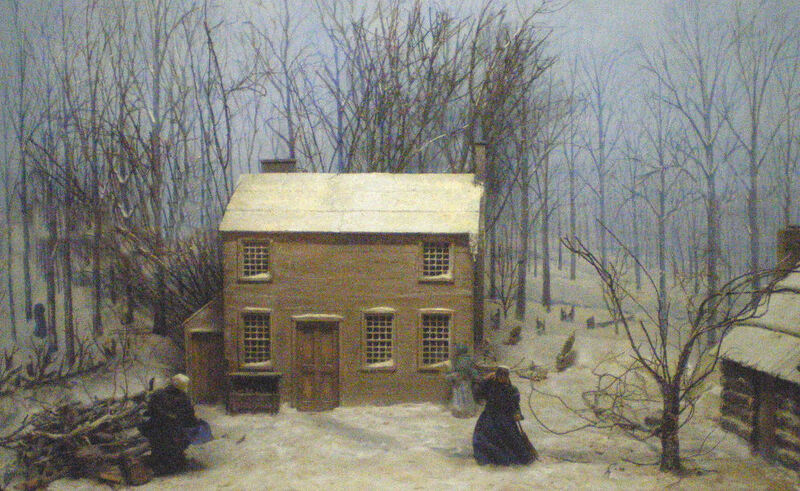 With winter fast approaching and no convent, Sister St. Théodore decided to buy the house that they were staying in. The Thrall family had another house nearby and was willing to move out so the six Sisters and four Postulants could stay till spring. It was during this time that the Bishop told the community to call Sister St. Théodore, Mother Théodore. On December 26, Mother Théodore became so ill that the Bishop gave her Last Rights. It was believed she was suffering from brain fever. She remained quite ill until February 15, 1841. Slowly recovering from near death, Mother Théodore had promised, that if she recovered, to have a statue of the Immaculate Conception for the convent chapel, which was gladly sent to her by her friend Monsieur Claude Marie Perrault de la Bertaudière(¹), in Soulaines, France. This is the statue that Monsieur Claude Marie Perrault de la Bertaudière sent to Mother Théodore Guérin. Saved from the fire of 1889, this statue was moved to the museum at Saint-Mary-of-the-Woods in 1990. Mother Théodore admired the honesty and uprightness of the Americans. 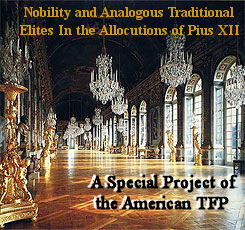 In establishing the new academy, she combined American ideas with French ideas. She brought a tradition from Ruillé, where the religious would salute the Guardian Angel of whomever they met. It was a devotion, she said, excellent for religious teachers, because their own duties to children were in so many ways like those of the Guardian Angels. She had a great devotion to Our Lady and founded the Sodality of the Children of Mary, which was never seen before in Indiana. Sister St. Francis Xavier LeFer (1816-1856) came from France in 1841 and "was the soul of the congregation," according to Mother Théodore. She foretold Mother Théodore's death, which occurred four months later. 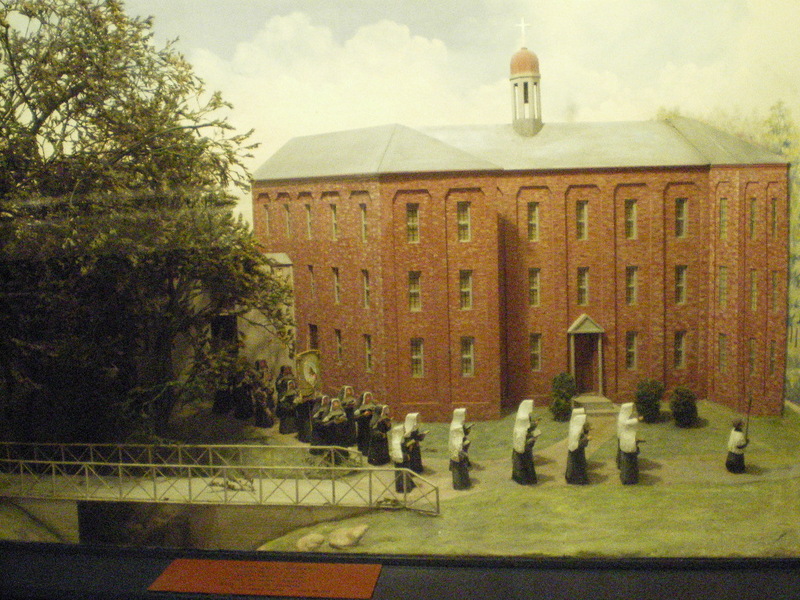 On July 5, 1841, the boarding school solemnly opened, with one student, Mary Lenoble. Despite the anti-Catholic bigotry that prevailed in the US, many Protestants were anxious for the academy to open. Two days later, four more students came and several more during the week. Nearly all of the new students were Protestant. The new academy, along with the surrounding property, is called Saint-Mary-of-the-Woods. Almost all of the fine arts education in the US was run by religious and it was this kind of education that Americans yearned for their children to have. Besides the basics, they wanted their children to learn drawing, music, and embroidering. The Sisters also taught rhetoric, chemistry, botany, natural philosophy, English and French. Saint Mary-of-the-Woods College. In 1825, George and Polly Smith acquired a land patent signed by Andrew Jackson. George Smith served as an aide and dispatch bearer to George Washington during the American Revolution. From the Smiths, Joseph and Sarah Thralls acquired a significant parcel of land in 1835, from which in turn a portion of land was sold to Bishop Simon Bruté and the diocese of Vincennes in 1838, becoming home to Saint Mary-of-the-Woods. In early spring of 1842, three Sisters were sent to Jasper to teach sixty students. Fr. Joseph Kundek was pastor here and had everything ready for the Sisters when they arrived. In autumn of 1842, another school was opened at Saint Francisville with two Sisters to teach forty students and a free school was opened in Saint-Mary-of-the-Woods. Joining Mother Théodore’s community at Saint-Mary-of-the-Woods, was Sr. Francis Xavier(²) from France, and newly professed Sister Mary Cecilia(³). Sr. Francis Xavier, who became the Mistress of Novices, “was the soul of the congregation,” according to Mother Théodore. Though frail by nature, she was very humble, had a profound love of God and was Mother Théodore’s greatest joy. She died a holy death shortly before Mother Théodore’s death. The fire of 1889 that destroyed the convent and chapel. The Sisters provided hot drinks to those men who kept a vigil over any hot embers. On October 2, 1842, Mother Théodore’s 44th birthday, one of the small houses caught fire and quickly spread to the barn, which held the freshly harvested winter wheat. It had been one of their best crops. Despite all help, everything was destroyed. “The Lord has given and the Lord has taken away,” Mother Théodore said. The cause of the fire was never discovered. $4,000 dollars in building, equipment and food were destroyed right before the coming harsh winter. Friends from all over poured food and money into Saint-Mary-of-the-Woods, though some of it came when winter was already upon them. It was one of their hardest times, but with God’s help they were able to get through it. It was at this time they received a new chaplain – Fr. Corbe and his encouraging words, support and advice during this hard time was enormously valuable to the Community. Fr. Corbe was dearly loved by the Sisters and it was he who was at the bedside of Mother Théodore when she died. With Fr. Corbe’s advice, Mother Théodore and her Community were able to persevere through situations that were much worse than a fire or even the harsh winters. Most Rev. 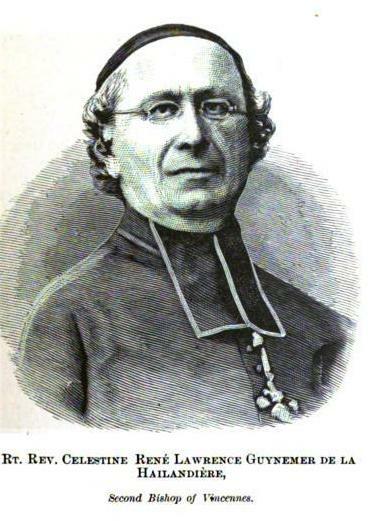 Célestine René Laurent Guynemer de la Hailandière (1798—1882), Bishop of Vincennes, Ind. Ever since arriving in the US, Mother Théodore had trouble with Rt. Rev. Célestin René Laurent Guynemer de la Hailandière, Second Bishop of Vincennes. According to many who worked with him, the Bishop was agreeable so long as one agreed with him. In a letter to Bishop Bouvier, Mother Théodore wrote, “He possesses a disposition, calculated to make a martyr out of its possessor, but still more out of those who mush bear with him. [Though he is pious and zealous], he is jealous of his authority and wants to do everything himself, with no delegation of anything.” Bishop de la Hailandière made it very clear that in all things his will was to be followed, despite the cost. Bishop de la Hailandière’s huge responsibilities included the debts, begging for money to keep his priests alive and the churches running, and also preventing the Protestants from buying them, led the Bishop to once write to Mother Théodore, “I am overwhelmed with a depression that nothing can relieve, not even the remarkable successes God has given you.” Mother Théodore bore with patience, the Bishop’s mood swings, though many times it was at a cost to her health. The Bishop treated Mother Théodore despicably and even severely in front of the postulants. He interfered with the admission of two members, who caused problems for the Community later (one did not have a vocation); he ordered buildings and additions to be made, all at the expense of the Sisters; he opened a mission without the approval of Mother Théodore; and he became increasing indifferent to Mother Théodore health. Bishop de la Hailandière possessed the deed to Saint-Mary-of-the-Woods, which he promised to sign over to Mother Théodore once she came to Indiana, but he continually reneged on that promise, which caused the delay in the expansion of the Academy. Mother Théodore, who had a hard time understanding Bishop de la Hailandière, wrote, “One would require a talent of never seeming to oppose the will or even the desire of our bishop, instead of bringing him always, and by good reasons, to will of his own accord what we desire, and let him think it done as he wished.” He was generous in some ways and difficult in others. Portrait of Queen Marie Amelie of France, Painted by Franz Xaver Winterhalter. 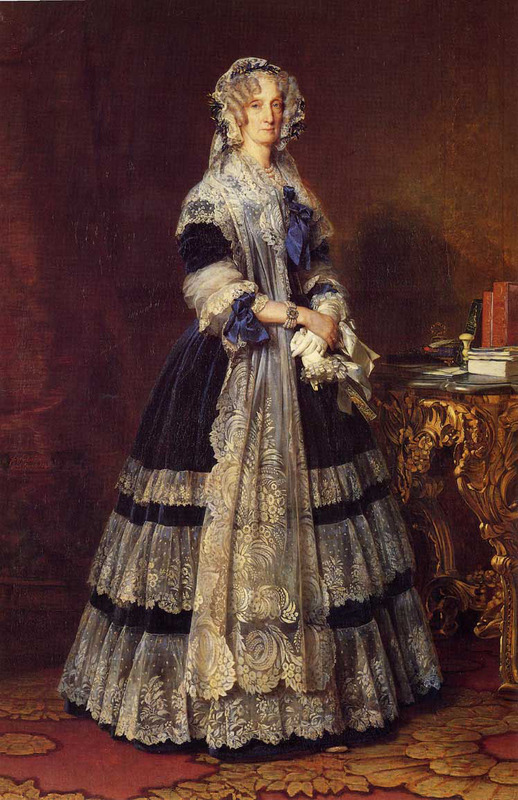 Queen Marie Amelie of France, who generously contributed to the financial needs of St. Théodore Guérin. This painting hangs in the Museum at Saint-Mary-of-the-Woods, Ind. On April 26, 1843, Mother Théodore and Sr. Mary Cecilia made a voyage to France in the hope of obtaining contributions to the American Mission. France was very generous in their donations to this worthy cause. Having secured financial aid to Saint-Mary-of-the-Woods, Mother Théodore returned to the US in November, but not before she met Queen Marie-Amélie of France, wife of Louis-Philippe and niece of Marie Antoinette. At the suggestion of a friend, Mother Théodore wrote a letter requesting an audience with the Queen, which was accepted. 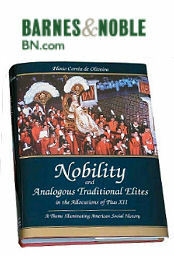 The Queen, despite the court, lived a devout life, hearing daily Mass and generously patronizing the Church and religious and charitable institutes. Portrait of Sister Mary Cecilia Bailly, who became the General Superior following the death of Mother Théodore. The St. Anne Shell Chapel, located near the cemetery, built by the nuns in fulfillment of a vow to St. Anne after being saved from a deadly storm at sea. The chapel doors are rarely locked, even if the door is closed. The queen kept her word, paying for the return voyage, plus she provided a large basket of food, “chosen from her own table by Her Majesty” and she gave an oil painting of herself, which Mother Théodore would later hang in the convent parlor at Saint-Mary-of-the-Woods. On their return voyage aboard the Nashville, they ran into a dangerous storm, with giant tides and gale-force winds pounding the ship. No one slept, since death seemed eminent. Water broke through one porthole flooding the Sister’s cabin, animals and lifeboats were swept overboard and during the second night of the storm a child died. The next morning, Mother Théodore made a vow that if they lived through this storm, she and those with her would build a chapel to St. Anne d’Auray in gratitude. In the afternoon, the ship capsized, with part of the ship underwater and more water flooding into the ship. All invoked St. Anne’s help again. Suddenly the wind lifted the ship upright, and by nightfall the storm was gone. Upon arrival in Indiana, Mother Théodore set to work in fulfilling that promise. 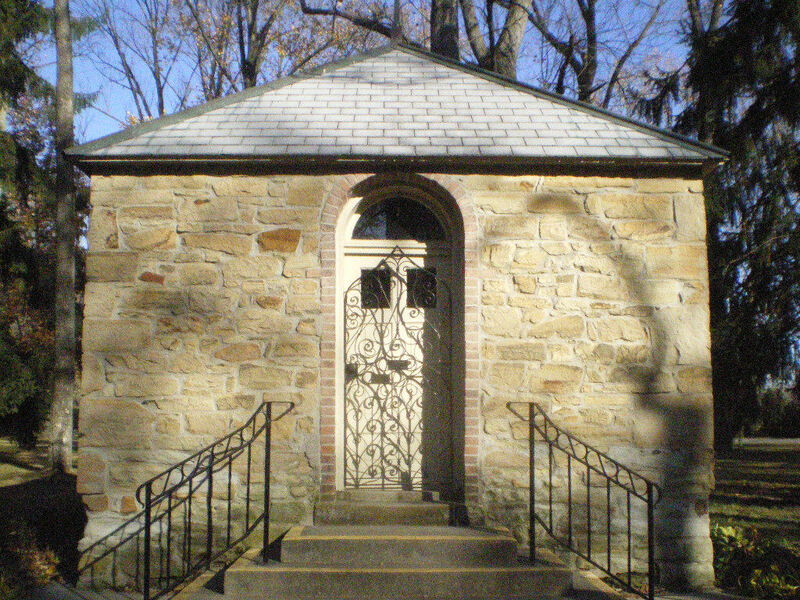 In 1843, the St. Anne Shell Chapel was completed. 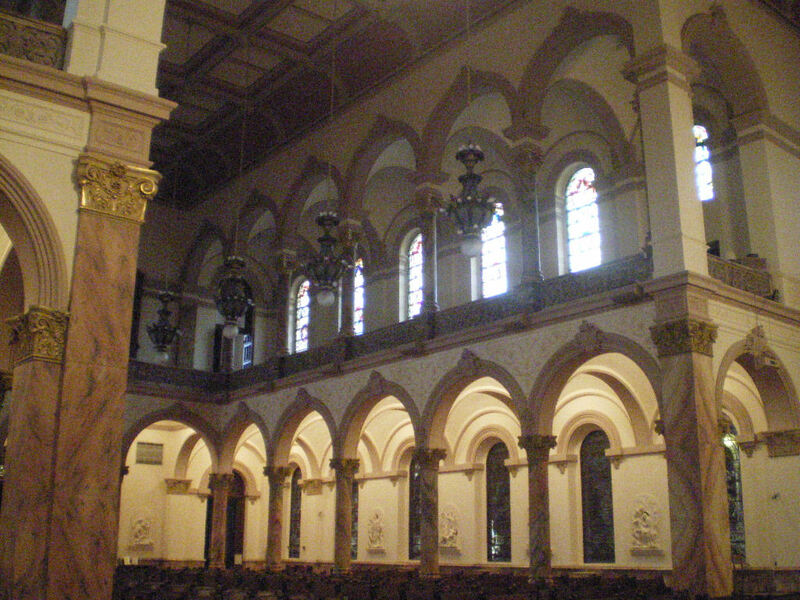 The Sisters had collected shells from the nearby Wabash River to decorate the interior, which was designed by Sister Mary Joseph le Fer de la Motte. A built-in altar, also covered in shells, holds a statue of St. Anne that Mother Théodore brought from France. In 1876, the deteriorating (exterior) logs were replaced with stone. Every July 25 since 1844, on the eve of the Feast of St. Anne, the Sisters gather for a solemn procession to the Shell Chapel in honor of St. Anne. 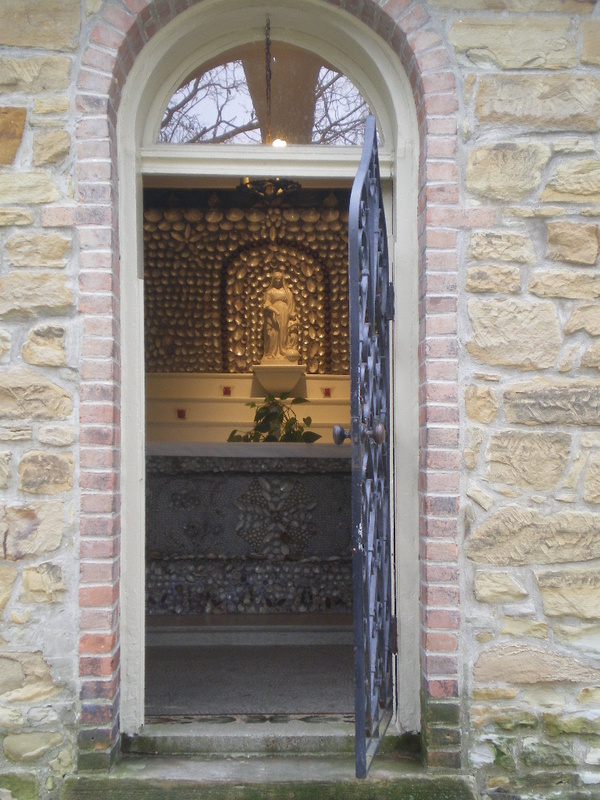 Interior of the Shell Chapel, decorated with the shells from the nearby Wabash River and the statue of St. Anne that Mother Théodore brought from France. The trouble with the Bishop during Mother Théodore’s absence only increased, worrying not only the Community, but other Bishops in the surrounding Dioceses. “St. Teresa said her greatest suffering was to be persecuted by good people,” Mother Théodore said. “I have sometimes felt like that about the Bishop.” Bishop de la Hailandière believed that the money Mother Théodore collected in France belonged to him and that he could elect a new general superior without her, both of which were wrong. “To oppose me is to oppose God,” he told Mother Théodore. 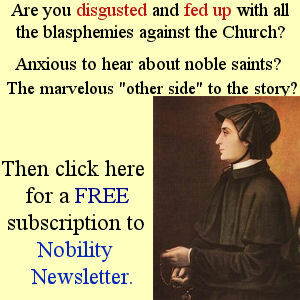 “I alone have any authority over you, and the least priest in the diocese has more power over your Community than has Mother Théodore.” Apparently Bishop de la Hailandière realized there was something wrong with his authoritative measures, and he twice requested to resign from his current position. On July 16, 1847, his request was accepted. Father John Stephen Bazin was elected the new bishop and though he only lived for 6 months, he restored peace and order to the Diocese. He officially gave the title of Mother to Mother Théodore, approved their Rule and signed the deed to the property over to Mother Théodore. Writing to Mother Théodore, he said, “The future is yours. I shall judge you only by it and your rule. A bishop should be a lever to a superior to raise her up from her heavy burdens, a confidant to whom she may entrust her troubles and from whom she may draw consolations.” Bishop Bazin died on April 23, 1848, after suffering eight days from a terrible cold. 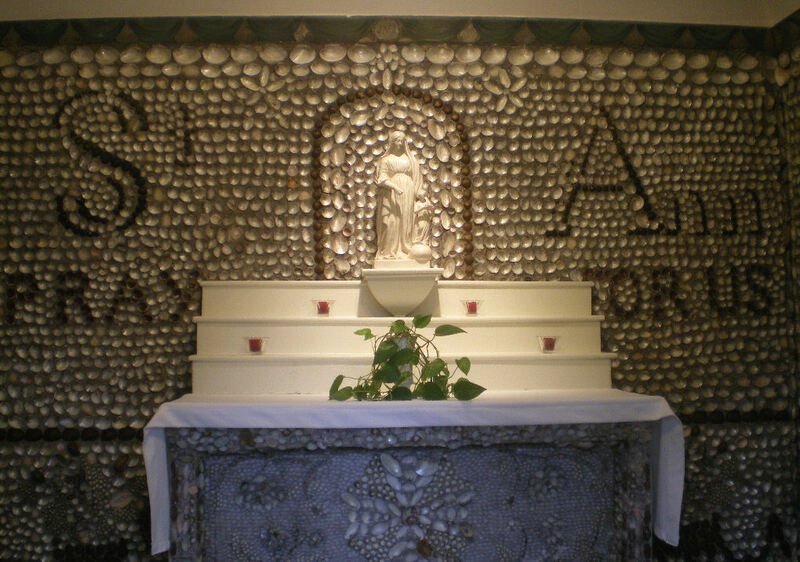 The shells inside of St. Anne's Shell Chapel were placed in the mortar by Sister Mary Joseph LeFer, sister of Sister St. Francis Xavier. 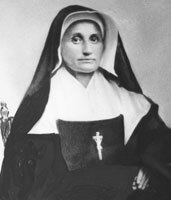 In 1846, Mother Théodore opened a mission in Fort Wayne, at the request of Father Benoit, who became a Chaplain to the three Sisters there. Fort Wayne was a former military post. Many of the Indian children, including the Chief’s, were students at the Sister’s Academy and lived there during the Autumn months. The Church of the Immaculate Conception was built with Indiana limestone in the Italian Renaissance style with a French sentiment. The stained glass windows were made by the Bavarian Art Institute of Munich and the marble in the church came from Italy, Africa, Skyros, Greece and the United States. The building design was inspired by La Trinita (the Cathedral Church of the Holy Trinity, 1867) in Paris. From 1840 to January 1849, Mother Théodore opened parish schools at Jasper, St. Peter’s, Vincennes, Madison, Fort Wayne and Terre Haute, all in Indiana, and at St. Francisville in Illinois. In 1853, she opened establishments in Evansville, Ind. and North Madison, Ind. ; in 1854, at Lanesville, Indiana; and in 1855 at Columbus, Indiana, south of Indianapolis. Additionally, with Bishop de Saint-Palais (who succeeded Bishop Bazin), Mother Théodore established two orphanages in Vincennes. By the time of Mother Théodore’s death in 1856, the Sisters of Providence congregation had grown from six Sisters and four postulants to 67 professed Sisters, nine novices and seven postulants(4). This enormous column with the statue of Our Lady at the top, is outside the Church of the Immaculate Conception, right in the main square. In late 1854, Mother Théodore had been ill, but not enough to keep her in bed, but she grew increasingly worse. On Dec. 8, 1854, the Dogma of the Immaculate Conception was proclaimed and Mother Théodore poured all her energy into a new chapel for Saint-Mary-of-the-Woods. “Nothing that is good has come to us except through Mary,” Mother Théodore said. Mother Théodore, who designed, planned and executed the construction of the church, never saw it completed. The cornerstone was laid in 1886, built in 1891, with the interior completed 16 years later. 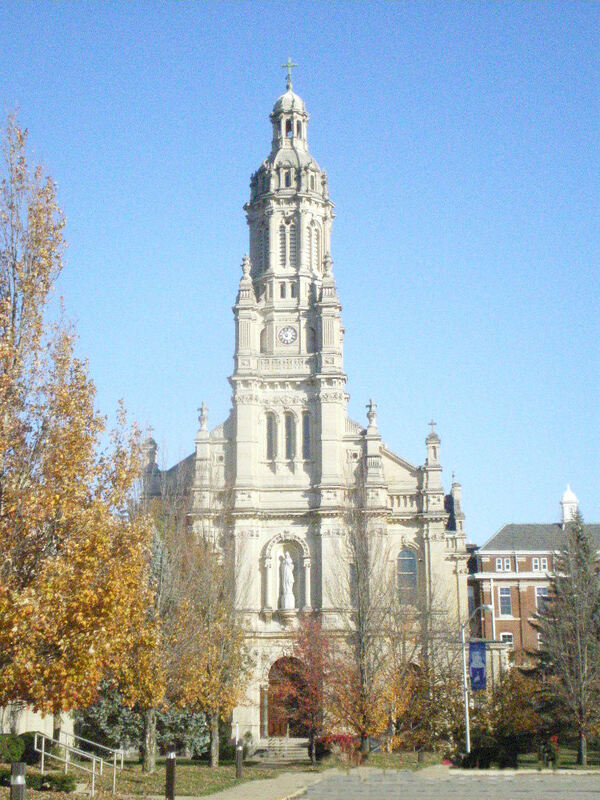 On October 23, 1907, the Church of the Immaculate Conception, built in honor of the proclamation of the Dogma of the Immaculate Conception, was consecrated. In March of 1856, Mother Théodore became confined to her bed and remained there until her death on May 14, 1856 at the age 57. 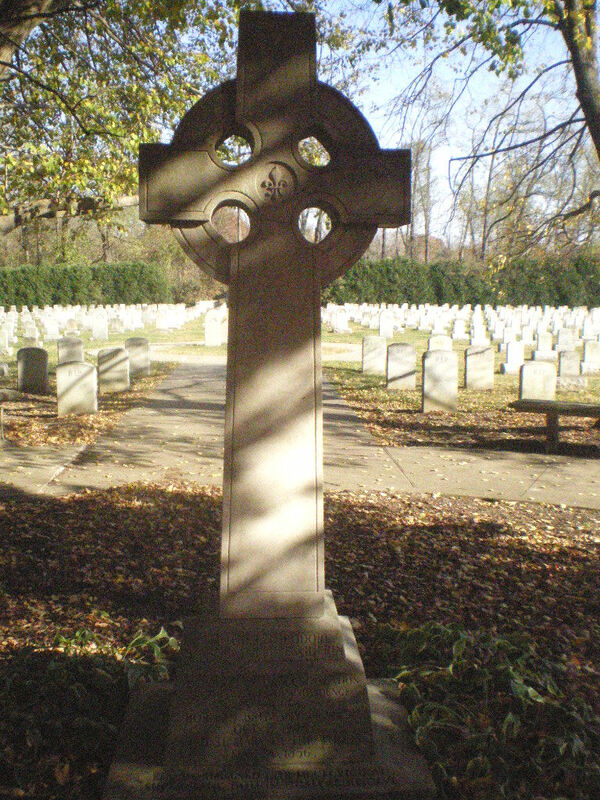 This Celtic Cross, in the Convent Cemetery, marks the original burial site of St. Théodore and some bones from her foot are still under this cross. Several tombstones in the cemetery are government-issue military headstones, honoring several Sisters of Providence who served in military hospitals during the Civil War. The Catholic Telegraph and Advocate in Cincinnati, published the following notice about Mother Théodore’s death. Died – At Saint Mary’s-of-the-Woods, Wednesday, 14th, Sister St. Théodore, Superior General of the Sisters of Providence in Indiana. The base of Mother Théodore's tombstone. The Latin inscription reads: "I sleep, but my heart watches over this house that I have built." “I sleep, but my heart watches over this house that I have built,” which sums up her whole life. On October 15, 2006, Mother Théodore Guérin was declared a Saint. Her remains are inside the Church of the Immaculate Conception, on the left hand side, along with the banner that hung in St. Peter’s during her canonization. Her feast day is October 3. St. Mother Théodore Guérin was truly heroic, a charitable noble devoted to Our Lady, who carried her cross with fortitude. She was skilled in business matters, a leader, and a beloved general superior. “And rest assured, if you lean with all your weight on Providence, you will find yourself well supported,” St. Mother Théodore Guérin. (¹) M. Claude Marie Perrault de la Bertaudière, Knight of the Royal and Military Order of St. Louis, was born in Angers, France in 1771. 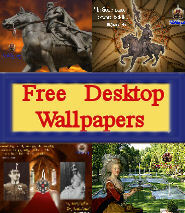 His ancestral chateau was confiscated during the French Revolution, along with a large portion of the family holdings. What wealth that was saved by one of his faithful servants, Monsieur de la Bertaudière, used for the good of the others and until his death his benevolence was felt by all, including the Sisters of Providence in Terre Haute, Indiana. (²) It was on the trip of Sr. Francis Xavier from France to Indiana, that she shared a stagecoach with Monsieur Dupont, also known as the Holy Man of Tours (Holy Face Devotion). The two said their rosary, prayed the Way of the Cross and Sr. Francis Xavier told about Saint-Mary-of-the-Woods. M. Dupont later sent to the Sisters of Providence a little flask of La Salette water, which she drank on her death bed and several chalices, which Mother Théodore distributed to several Religious, including the Holy Cross Brothers who had missions in that area of Indiana. (³) Eleanor Bailly, (professed Sister Mary Cecilia), became the second Superior General after Mother Théodore’s death. Her father was a wealthy fur trader of distinguished French lineage and her mother was an Indian princess of the Ottawa tribe. Both were staunch Catholics. (4) In 1855, two of Mother Théodore’s nieces joined the Sisters of Providence in Indiana, one niece taking the name of her aunt, Sr. Mary Theodore. 1. 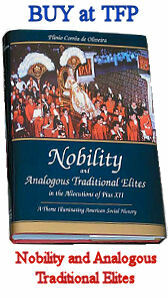 Mary Theodosia Mug, Life and life–work of Mother Theodore Guerin: foundress of the Sisters of Providence at St.-Mary-of-the-Woods, Vigo County, Indiana (New York: Benzinger Brothers, 1904). 2. Katherine Burton, The Eighth American Saint: The Story of Saint Mother Theodore Guerin, Foundress of the Sisters of Providence of Saint Mary-Of-The-Woods, Indiana (Chicago: Acta Publications, 2006). 4. Sister Mary Borromeo Brown, Ph.D., The History of the Sisters of Providence of Saint Mary-of-the-Woods (Benziger Brothers, Inc., 1949), in two volumes.